Good Job, Good Effort | HELLO, Loser. After the Miami Heat’s loss last night in Miami, the players were walking back through the tunnel to get to their locker room when they were cheered on by a young fan yelling “good job, good effort”. The game had been verrrry close at the end. It was at home. The Heat lost and went down 3-2 in the series to Boston. I’m surprised Udonis Haslem didn’t punch this kid in the face. I know I would have. POW! 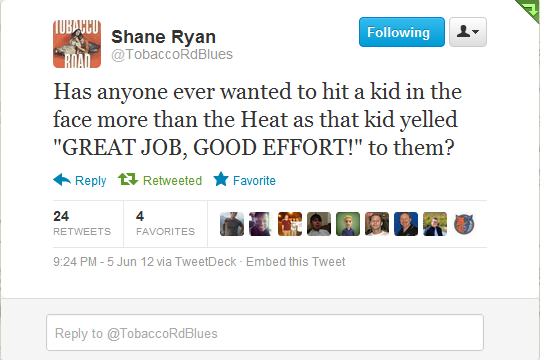 Had the kid been moving at all, Shane Battier would’ve gladly stepped in to take a charge so as to foul the kid out.